Gobystan is a geographical area in the east of Azerbaijan.. In its eastern part, bonded by the Caspian Sea, at sixty kilometres south of Baku, in the" Vicinity of the township called Gobystan, there are three mountains covered with stones, i. e. Beyukdash, Kichikdash, Djingirdash. Numerous rock engravings, some caves where ou ancestors lived, were discovered among the rocks and stopes scattered about the territory of these mountains, the finds also include the burial places with their remains, the settlements of the subsequent periods and the remains of the structures and other historical monuments. In the Stone Age the summits of these mountains were used as traps for the hunt of ancient bulls, while in the Bronze Age they played the role of the magnificent stronghold. The complex of these mountains make up an open-air museum. In spite of seemingly dry and poor outward appearance of the nature, Gobystan in the past was rich in fauna and flora, characteristic of the savanna. The primitive people were attacted by a great number of cattle herds, as the objecting. As early as in the Middle Stone [Mesolithic] Age, in the shelters among the rock of Gobystan they set up camps, lived on hunting for animals in the nearby area, gathering edible fruit and plants. As the millenia went by, life was changing too, other time periods came and went, the historical epochs succeeded one another, changing the way of cul¬tural standards. The changes found their reflection in the rock engravings of Gobystan, since, they, being the remnants of the material-cultural relics, piled up the cultural, strata of ancient sites. Therefore the collection of the wonderful petroglyphs and the area of Beyukdash, Kichidash and Djingirdash Jazyly-tepe, rich in various historico-archaelogical monuments was declared to be the Historico-artistical reserve according to the decree of the Council of Ministers of the Azerbaijan SSR frofrom since September 9, 1966. In the mountains of Beyukdash and Kichikdash on the stones of the rock kingdom, the relict of the primitive art, i. e. the ancient petroglyphic drawings charm the visitors with the reality of expression and vital power. in the si¬lence of the rocks as if you hear the voices, feel the breathing of primitive men. Looking at the rock engravings, you transfer yourself to the Middle Stone [mesolithic] Age, get acquainted with the way of life, occupation, attire of the people of that prey. These stone chronicles narrating about distant millenia, are valuable historical sources. Carved on the rocks of Gobystan there are manly representations of people and animals. The hollow in the rocks hewn with the hands of our ancestors, the loops for tying up the animals, symbols and brands, traces of the feet on the stone, the altar cut in the rock and" other-relics tell us tales of the remote past. The representations of people occur, manly, on the walls of the ancient sites. The oldest of them, with front and side view represent primitive hunts¬men and sacred woman the mother, as symbol of procreation of the human race; they are carved in the shape of the reverse bas-relief. The men of the Mesolithis period are tall, the calves of. the legs are bulging, they are armed wttit a bow and clad in the loincloth. These drawings have immortalized the memory of the men who distinguished themselves in hunting and labour, a!s well as, the elders of the tribe. The women are depicted as having full breasts and fat hips, they represent the symbols of worshipping the mot- her-continuer of the kin, the keeper of the sacred hearth. The representations of the animals give us some notions about the animal kingdom existing in this territory before the 10th-12th millenia W. C. They portay the bulls, hens, snow leopards, dogs, foxes, etc. There are some drawings fishes,, snakes, lizzards, insects, etc. The oldest of the subsequent ones are executed in more realistic and symmetrical manner, the subsequent ones are shown by schematic lines. The reason of this realism. should be considered as an evidence that the ancient dwellers of Gobystan knew life perfectly well, they checked the animals they hunted for, studied their nature and behavior. The scenes depicting the only stallion in the herd, the lions devouring goats at the front side, the pictures of grazing or drinking bulls, the dogs chase after the boar, the running deer, fighting bulls, goats; the bull, fallen into a trap,— all these are perceived as a picturesque plane, created as a result of the wonderful power observation of the ancient dwellers of Gobystan. The amount of the ancient drawings on the stone slabs af_Gobjystan is not so great as compared with some collections of ancient drawings found elsewhere. The rock engravings of Gobystan, however, are unique in their subject versa-u¬tility, compositional execution and chronological range. This chronicle of the remote ages in stone tells us about the roots of the graphic art of Azerbaijan, while the scene of the 'yally' dance shows the origin of the theatrical and bal¬let arts. The depiction of boats testify to the fact that ship-building in Go bystan is the oldest in the world. This stone tambourine, which has come down to the day, was used by our ancestors as a musical instrument, 'gavala', thus confirming their acquaintance with music. The ancient dwellers of Gobystan performed the festive processions and the 'yally' dance to the sounds of this stone. The 'yally' dance was a ritual, by if the hunters acquired the habited of swithness and staunchness, necessary for hunting, they trained hunting skills and movements. Though this dance has subsequently lost its original meaning and purpose, it is still existing in the life of the Azerbaijanians as a popular dance 'yally'. Gobystan can be called a stone book of the Stone Age, one of the youngest monuments of this book is a Roman inscription cut in Latin, which is 1990 years old. The rock engravings of Gobystan were first discovered in 1939 by the oldest architect, now the late Iskhak Djaffarzade. Due to his efforts from 1940 till 1965 over 3,500 ancient petroglyphs on 750 rock faces have become known to the science. The main data. on the deciphering the rock engravings of Gobystan, specifying the date and purpose of their execution, as well as the economic life, labour implements, ways of hunting, cultural and social system, world outlook, traditions and customs have become accessible due to the participation of the author of this article and F. M. Muradova, Candidate of Sciences (History). Up "to the present, about 6,000 ancient petroglyphs drawings have been found in Gobystan. These rock engravings carved in the soft lime-stone, are, however, only part of all the pages of this stone book the old legend of life, which were bequeathed to us by the artists of that time. Only 5-10 per cent of them have been preserved, the rest were washed off by the torrents of raging storms, effaced with lime-stones, were blown away, broke off by layers and have come down to the present times in such condition. Some part remained under the cultural strata, formed under the ancient sites and settlements. The Gobystan petroglyphs—rock graphic scripts — were cut by the primitive artists of the drawing, executed in the syurtme technique, i. e. using cutting and dyes, made from the mixture of natural chre and fat. The traces of ochre often found in archaeological excavations. The artists probably filled the drawings hewn in the rocks with paints. Being exposed to the open-air during thousands of years these drawings have been lost. The archaelogical excavations have been conducted in Gobystan, i. e. on the sites 'Ana zaga", "Ovchular zagasy", "Chardag zagasy", "Kyaniza", "Okyuz-lar", "Dash' alty",. "Kaya arasy", "Firuz", "Shongar", "Djeiranlar", in the settlements "Beyukdash", "Daire", "Chapmaly" and in more than 30 barrows. As a result, the archaeological fund of the museum of the Gobystan Reserve has received over 53,000 rempats of material culture-archaelogical finds. They include flint, pebbles and labour tools, arrow heads, made of bone, weapons made of bronze, clay vessels, made of various materials, etc. The tools made of flint mainly include sharp points of micro sized type, gear-wheels in assembly having geometrical shape: the triangle, the segment, the trapezoid; groomers, awls, cutting tools, chisel, etc. They are made from knife-shaped blades, blades chipped off the stone kernels. Impact tools for rock engravings, grates for thrashing edible roots, and cereal grains, hammers, addices and other kinds of large-sized tools were produced from pebbles. Bones were used for making tools for weaving, fishing nets, harpoon, tools for polished leather, awls, etc. The results of archaeological excavations done in Gobystan, show the Mesolithic and Neolithic periods, the inhabitants of these area the assembled tools; they were engaged in hunting and fishing. The anthropological structure of the human crania from the burial mound of the late Mesolithic period, found on the "Firuz" side supports the idea that the people populated Gobystan were the ancestors of the present-day Azerbaijanians.The animals in Gobystan became domestic in the Neolithic period. During this period the ancient Gobystanians could fashion clay vessels, began to navigate ships, which they built themselves. This is confirmed by the drawings of boats, hewn on the rocks of Gobystan. It is not accidental that a famous Norwegian seafarer and scientist Thor Heyeraahl-made a special trip to Gobystan to see the drawings of the boats. In Gobystan," he saw the drawings of the ships of the "Tigris" type, built from the reed scraped off the tree trunk and the rush, as well as the depictions of busketshaped ships. He was also interested in the archaeological finds. In his opinion, everything he saw in Gobystan, leaves far behind the evidence found by him in literature. He also admitted that unlike other places, it is in Gobystan, that he saw for the first time the sun on the manest. Having defined Gobystan as one of the oldest centres of highly-developed culture Thor Heyerdahl hoped that the Azerbaijanian scientists would be able to uncover the mysteries of this culture. Gobystan is the land of fairy-tale mysteries. Their disclosure is very important for the studies of the history of ancient Azerbaijan. 1. FRONT COVER. ROCK DRAWING "HOME-COMING FROM HUNTING", UPPER UPPER TERRACE OF BEYKDANSH MOUNTAIN, 8-TH CENTURY W.S. 2. VIEW OF BEYUKDASH MOUNTAIN. 3. IMAGE OF A DEER ON "YAZYLY-TEPE", ROCK N29. 4. ANCIENT DRAWING PANEL IN THE "ANA-ZAGA" CAVE. 5. DRAWING OF A BUCK AND A DOE. 6. "YALLY" DANCE, BEYUKDASH MOUNTAIN, UPPER TERRASE, ROCK N9 39. 7. PICTURE OF THE ANCIENT "YALLY" DANSE, BEYUKDASH MOUNTAIN, UPPER TERRACE. 8. IMAGES OF GIRLS —"OKUZLAR", BEYUKDASH MOUNTAIN, UPPER TERRACE. 9. "SEVEN BEAUTIES", BEYUKDASH MOUNTAIN, UPPER TERRACE. 10. ANCIENT IMAGES OF PERPLE. 11. A HUNTING SCENE, BEYUKDASH MOUNTAIN. 12. IMAGE OF WOMEN AND "YALLY" DANCE IN THE "OVCHULAR" CAVE, BEYUKDASH MOUNTAIN, UPPER TERRACE. 13. ROCK DRAVING "BULLS" AND "SCENE OF SHIPWRECK" IN THE "OKUZLAR" CAVE, BEYUKDASH MOUNTAIN, UPPER TERRACE. 14. PICTURE OF "A HERD OF KULANS" IN THE "OVCHULAR" CAVE, BEUKDASH MOUNTAIN, BEYUKDASH MOUNTAIN, UPPER TERRACE. 15. IMAGE OF A BULL, BEYUKDASH MOUNTAIN, LOWER TERRACE. 16. IMAGE OF A BULL [NEOLITHIC AGE], ROCK N2 65, BEYUKDASH MOUNTAIN, UPPER TERRACE. 17. A HUNTING SCENE IN THE "OVCHULAR" CAVE, BEYUKDASH MOUNTAIN, UPPER TERRACE. 19. IMAGE OF A GOAT 4-TH—3-D CENTURY B. C., BEYUKDASH MOUNTAIN LOWER TERRACE ROCK N2 10. 20. IMAGE OF A DOMESTICATED ANIMAL BEYUKDASH MOUNTAIN UPPER TERRACE. 21. IMAGE OF A BOATJ 7-TH—6-CENTURY B. C., KICHIKDANSH MOUNTAIN, R.OCK N2 48. 22. DRAWINGS OF THE - ANCIENT BOATS BEYUKDASH MOUNTAIN LOWER TERRACE ROCK N2 8. 23. DRAWINGS OF WlfcD BOAR-HUNTING WITH D.OGS COVERED AFTER THE ARCHELOGICAL EXCAVATIONS. 24. IMAGE OF A MAN WITH HEAD-DRESS. 25. BRONZE WEAPONS FROM ARCHEOLOGICAL EXCAVATION. 26. IMAGE OF A BIRD. 27. ANCIENT STONE MUSICAL INSTRUMENT "GAVALDASH" [STANE TAMBOURINE] OF GOBYSTAN, BEYUKDASH MOUNTAIN LOWER TERRACE. 29. A FACIFUL STONE OF GOBYSTAN. 31. A FANCIFUL STONE OF GOBYSTAN. 32. STONE "HONEYCOMBS" IN GOBYSTAN. 33. IMAGES OF A WOMAN, "ANA-ZAGA"CAVE [BACK COVER]. Soilmec SR-45 is finally in Turkey after it started its production 4 years ago. Almost all foundation industries technology started in Soilmec’s dynamic and creative design department. 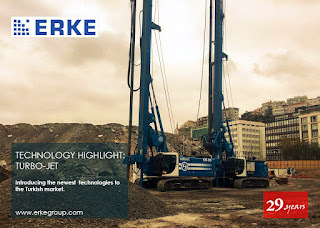 Soilmec cooperated with the top-level design group, Porche Design and this proved their claim to being the only leader in their area of expertise. The technology of in-situ soil mixing, by adding an appropriate stabilizing agent, can be applied to a wide range of geotechnical design problems. Very good results are achieved by properly using either isolated columns of consolidated soil or combinations of columns forming geometrically defined structures. St. Stephen Church is one of the most important structures left in the this concrete jungle of a city, Istanbul. It was built 120 years ago by the Orthodox Bulgarian community on the shore of the Golden Horn. The church is also known as the Iron Church and it was reopened after a lengthy restoration process. In the 19th century, the Orthodox churches in Istanbul performed sacraments in Greek. Therefore, the Bulgarians asked permission from the Fener Greek Patriarchate to establish an independent church in Istanbul in order to have the sacraments in their own language. But the Patriarchate rejected their wish. Thereupon, the Bulgarians decided to leave the Greek Patriarchate and have their own independent church.